The MEICF met Mr. Khan ( Minister for Minority Development), and impressed upon him the issues East Indians faced in order to get the OBC certificate. Guidelines for Members who do not have East Indian mentioned on their Baptism Certificate and who wish to have “Caste -East Indian Catholic” endorsed in the remarks column of their Baptism certificate. 1) Address an application as per format attached to the Chancellor, Archdiocese of Bombay. 3) Attach a xerox copy of your Baptism Certificate. Submit the application and the two attachments to the Chancellor. Maintain a follow-up with the Parish Priest of the Church where you were baptised to obtain a fresh Birth Certificate with “Caste-East Indian Catholic” endorsed. Follow-up should be done after reasonable time has elapsed since the submission of your application to the Chancellor. I am an East Indian and request that “Caste-East Indian Catholic” be entered in the Remarks column of my Baptism Certificate. 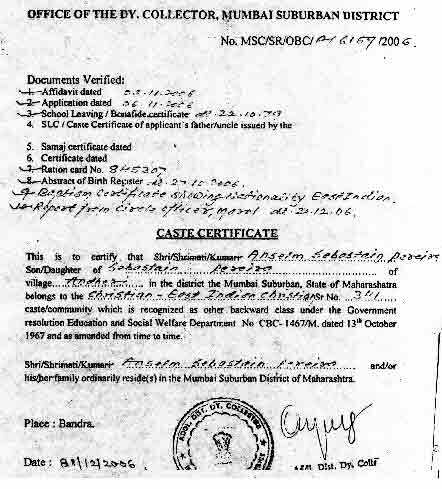 Dated ______________ issued by the Bombay East Indian Association, certifying that I am an “East Indian Catholic”. to make the relevant entry in my Baptism Certificate (copy enclosed). First East Indian to receive the OBC Certificate : Mr. Anselm Pereira. In reply to his RTI, Adv. Godfrey Pimenta was informed that: of the 7 OBC Applications received by the Colector's office, 5 applicants have ben given the OBC certificate, and the other 2 application are in process. Adv. Godfrey Pimenta and Adv. Vivian D'souza have compiled a booklet with regards procedures and benefits of the OBC. This booklet is available at the Bombay East Indian Association, Bandra. Frequently asked question about obtainng the OBC Certificate sent in by Mr. Godfrey Pimenta and MCBBS. There were a demands that a committee of like minded East Indians should be setup for this cause. MAHARASHTRA CHRISTI BHOOMIPUTRA BHANDAV SANGATHANA.